Once upon a time, on a dark winter night there was a masquerade held at a cottage at Soppeenmäki. While snowflakes whirled wildly outside, a merry company was gathered inside. Among other peculiar creatures one could see Maija the Winter Fairy, Jarno, the King of Trolls and Kaisa the Elf. The costume of Winter Fairy was based on a lovely old baby-blue under bust -corset, of which you can find further information here. The top made to go with it was trimmed for the occasion with tulle and marabou feather band. 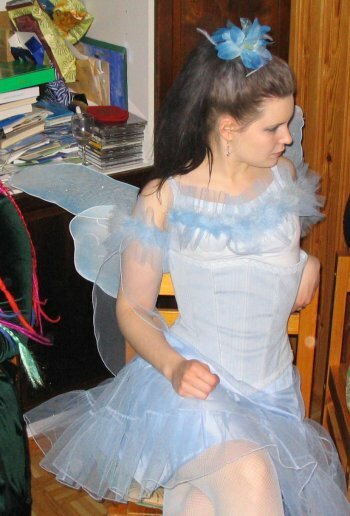 Our Fairy also needed a fluffy tulle skirt with blue satin lining for decency's sake, and a sort of imitation of sleeves held on the arm by the magic of elastic band. From the mysterious, almost forgotten depths of the closet was found ice blue fishnet pantyhose, as a further proof that no matter what some people say, you will some day need most of the cute things you pick up from sale. The outfit was completed by an organza flower and the matching wings from Punanaamio's booth at the Faire. Unfortunately they are not very good for actually flying around in the air, but they look just right. The Mighty King of Trolls was clad in old corduroy jeans and a shirt made of old bedsheets, originally made for a pirate costume from which there unfortunately are no pictures. The King of Trolls was also presented with a new faux-fur waistcoat and laced leg-warmers, but as Winter Fairy was busy doing her make up, he had to take care of himself and thus he took with him the wrong plastic bag - not the one with the waistcoat and leg-warmers, but the one where the leftover of the fur was stuffed. Thus he had just a piece of fur to wear. 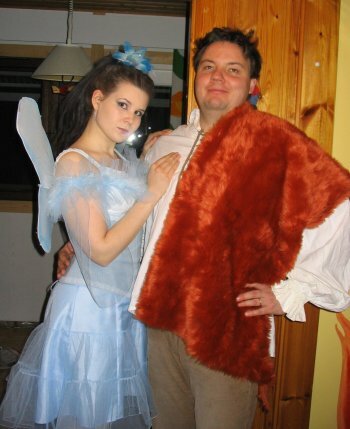 Luckily Winter Fairy had at least remembered the tail, without which no troll costume is ever quite complete. From the folk of the Magical Forest there was also present Kaisa the Elf. Her mossy velvet top and skirt were part of a very old masquerade costume of Maija's. Everybody had merry time, and the revelry continued almost till sunrise. The eve of First of May is the time for merry company and masquerades. For once in a year we can forget that we are serious, gloomy Finns and even dare to venture out of home in costume. 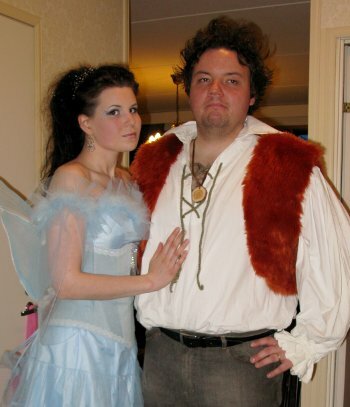 Thus it happened that Winterfairy and The King of Trolls made their re-appearance. 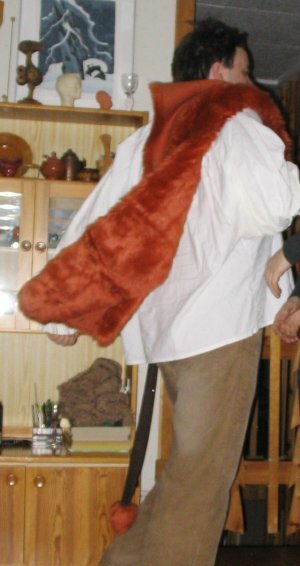 This time The King of Trolls got to wear his fur vest, and also a wooden necklace made by my father. Almost last minute Winterairy became obsessed with getting a new bodice for her costume. It happened that there was still some blue satin left from the skirt, and she attacked it with the frenzy of a monomaniac. The result was a nice little top, and also a good pattern for a well fitting strapless bodice that may very well prove useful in future project too. This time Winterfairy dressed up for an even more icy look than last time with Christmas decoration and glittering jewellery. Although the picture does not really capture it, she had a heavy doze of glitter hairspray as well, not only in her hair but also all over her pale shoulders and bathroom floor. Fairy wings needed a bit of repair and twisting after the last party, and I dare say after this one too. Crowded nightclubs are not quite the place for wings. 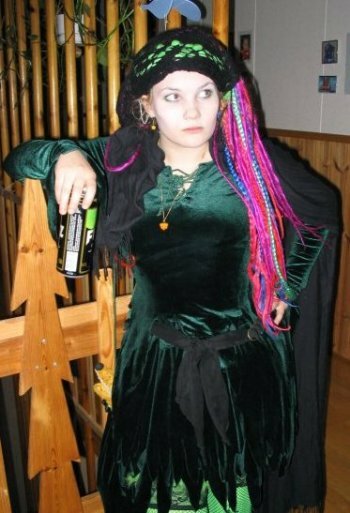 Then again, my first costume idea included a tall wig and hoops so this was actually the practical compromize!